After the QUE?! award of Oxfam and the VMx award for best thesis environmental professional, our research group was involved with another laureate. 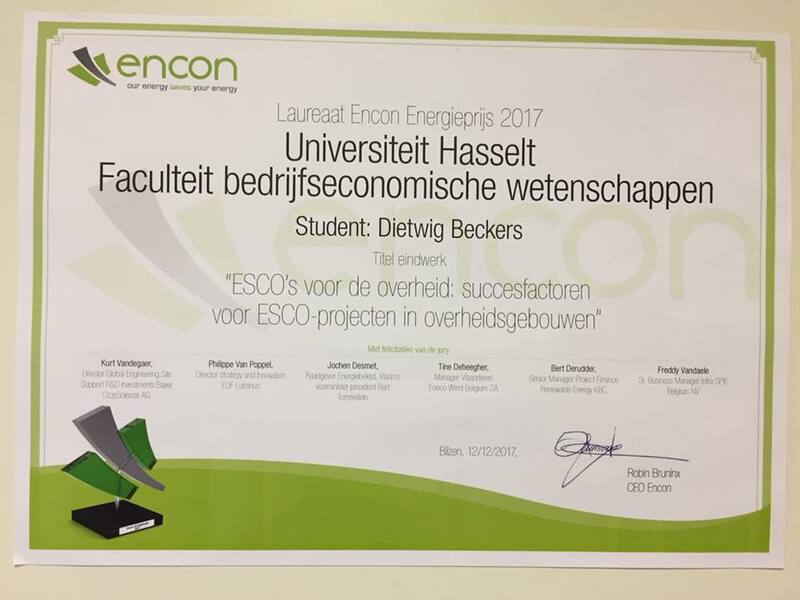 This time it was one of our master students (Dietwig Beckers) who made it to the final of the Encon Energy Prize 2017. Dietwig graduated in June as a Business Engineer in the major Technology, Innovation and Environmental Management. Dietwig wrote a master thesis about critical success factors for energy service company projects in the governmental sector, which was promoted by Tom Kuppens. One of his findings was that the time frame (determined by the duration of legislature) for budgets within local governments can be a burden to the success. Clustering small projects and the presence of a market facilitator on the other hand can positively affect the success of ESCO projects, as it generates economies of scale and trust. Together with the energy coach of a school community in the region of Sint-Niklaas, he translated the data from energy audits into an economic model. With his work, the school community was better informed to select the best combination of energy saving measures and the most influential parameters, amongst which the energy price, on the profitability. As a result, it was the first school community in Flanders that signed an energy performance contract with an ESCO. We wish Dietwig good luck in his professional career and thank co-promoter Dirk Franco and Evelien Cruyplandt (energy coach) for their valuable cooperation.